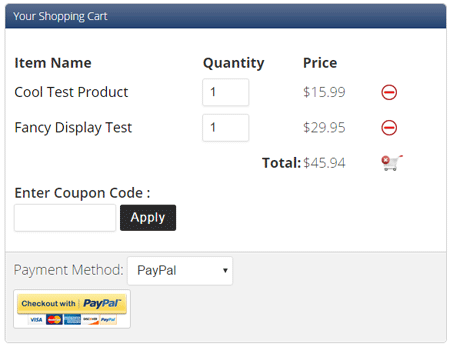 WP eStore plugin comes with a few pre-configured shopping cart display templates. You can use any of these templates (by using a shortcode) to show the shopping cart on your site. All the cart shortcodes are listed in our shortcodes documentation page. 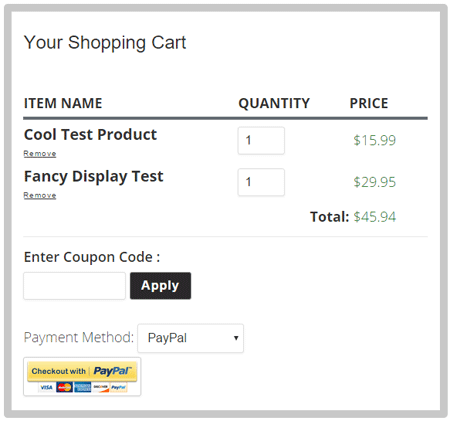 In addition to the above full cart templates, the WP eStore plugin comes with a few compact cart shortcodes also. View the compact cart display options page to learn more about it. 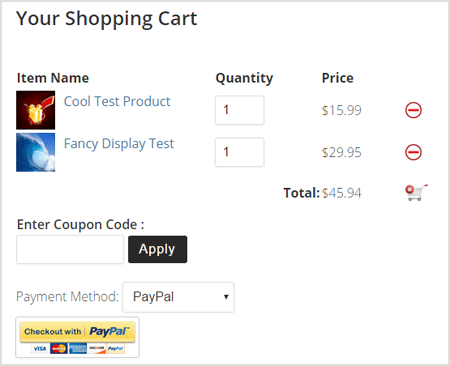 This page explains how you can create a specific cart checkout page for your site if you want to. You can use the “Product Specific Instructions” feature of WP eStore to send special instructions (specific to a product) to your customers. Your customers will only get this info when they purchase this product in question. Send some special usage instructions specific to that product. Explain some steps that they need to do before they can use the item. Send them access to a URL that is password protected (you can share the URL and the password using this option). Share the password to open the file (if there is one). Step 2) Edit the buyer email body (from the Email Settings menu of WP eStore). This documentation is only for developers. If you are not a developer then you have no need to read this. First read this post to understand some basics. //TODO - write your autoresponder signup code here. The value you specify in the “List Name” field (under the autoresponder settings section of the product) will be passed in the above function using the “list_name” parameter. Login to your Bitly account (Please sign up for an account if you don’t have one). Generate a generic access token here by confirming your account password at the bottom of the page. Enter your Bitly access token and save the settings. The latest products shortcode allows you to display any number of latest products (based on the date added to your store). How to Display Your Latest Products. You can use the eStore and the Extra Shortcodes add-on to display a list of your latest products. To do this all you need to do is follow the steps outlined below. Step 1: You will need to have the eStore and the Extra Shortcodes add-on installed on your site. Step 2: Create a page where you want to display the list of latest products. You can also use an existing page or widget. Step 3: Place the below shortcode where you want a list of your latest products to be displayed. Parameters you can modify in this shortcode. • Number of products (number) This is how many products you want to be displayed using the shortcode. Example: If you set this number to 5 the shortcode will display the 5 most popular products. • Style (style) This allows you to use different fancy displays to show your products. You can see a full list of the fancy display templates here. The random products shortcode allows you to display any number of random products from your available products . You can use the eStore and the Extra Shortcodes add-on to display a list of your random products. To do this all you need to do is follow the steps outlined below. Step 2: Create a page where you want to display the list of random products. You can also use an existing page or widget. Step 3: Place one of the below shortcodes where you want a list of random products to be displayed. • Button type (type) This allows you to specify what type of button you want to use. Example: Buy Now, Add to Cart, Subscription or Download Now. • Style (style) This allows you to use different fancy displays to show your products. You can see a full list of the fancy displays here. • Category ID (cat_id) This allows you to specify a category that you want the random products to be displayed from. When you use this shortcode it will only take the random products from the specified category. Display any number of popular products (based on the number of quantity sold) from your available products. How to Display Your Popular Products. You can use the eStore and the Extra Shortcodes add-on to display popular products easily. You just need to follow the steps outlined below. Step 2: Create a page where you want to display the list of popular products. You can also use an existing page or widget. Step 3: Place the below shortcode where you want your popular products to be displayed. You can automatically give a discount to your emember users on your eStore products. Normal visitors (non-members) of the site will see the standard full product price. Logged in members of the site will see a discounted price (according to the discount rate you set in the settings). Step 3) Go to the “WP eMember Integration” section and check the “Enable Auto Discounts For Members” option. Step 4) Specify a discount rate in the “Member Discount Amount” field. For example: use a value like 25 if the members should automatically receive a 25% discount. Step 6) This step is optional. You can edit your membership level and apply a different discount rate if you want to offer different discount to different levels. For example: you may want to apply 15% discount to silver level members and 30% discount to gold level members. When members go to your store page, they will automatically see the discounted product price (according to their membership access level). 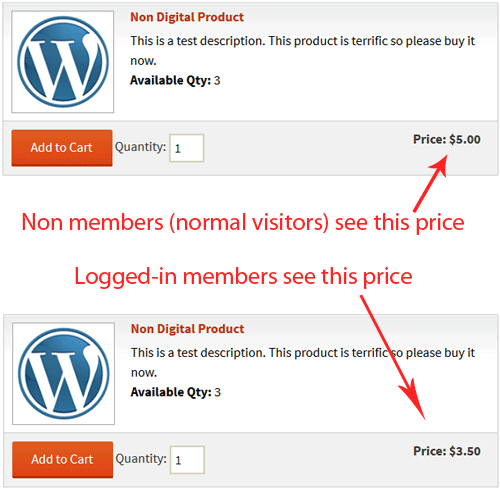 Normal visitors (non-members) will continue to see the standard product price. 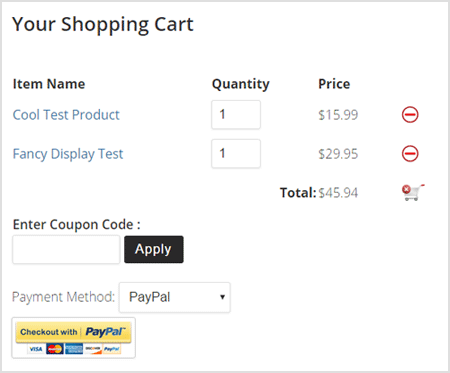 This works for any fancy product display templates offered in WP eStore. So this will work even if you are using it on a sales/landing page (instead of a store page). If you needed to create multiple customer record entries with a slight variation then use the “copy customer record” feature of the eStore plugin. You can copy the existing customer record then change the value of some fields (for example: the products they purchased) then save it as a new record. In this tutorial I will explain how you can charge a “Pay What You Want Price” to sell your products. There is an option in the eStore that allows you to make products where customers can choose what they want to pay you for a product. Step 1: Create a product as you would normally do. 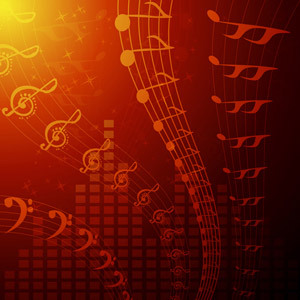 This is a test description. This description is here to show how the description of this product looks like.